Illustration and the power of the drawn image are at the heart of this issue of Eye. Myriad new technologies affect the way illustrated images can be created, developed and disseminated, yet Olivier Kugler (whose portrait of Syrian refugee Muhamed graces the cover) does all his drawings in pencil. The business of illustrating – of observing, listening, thinking and making marks to communicate with clarity and feeling – has changed little since Edward Ardizzone documented the bombed-out cities and survivors of mid-century Europe. The Guardian’s use of illustration to complement long, serious essays is cheering in an age of soundbites and populism. Lora Lamm’s contribution to the canon of advertising design deserves our attention, as does Ruth Artmonsky’s determination to champion illustrative work from a forgotten age of publicity. Another lost era is evoked in the article about Bentley / Farrell / Burnett (BFB), whose extravagant, late-1960s aesthetic seems more remote than Lamm’s. Meanwhile Peter Brookes – who also makes his initial drawings in pencil – aims barbed, highly crafted cartoons at the absurdities of current affairs, while facing political realities that increasingly outpace the satirist’s imagination. 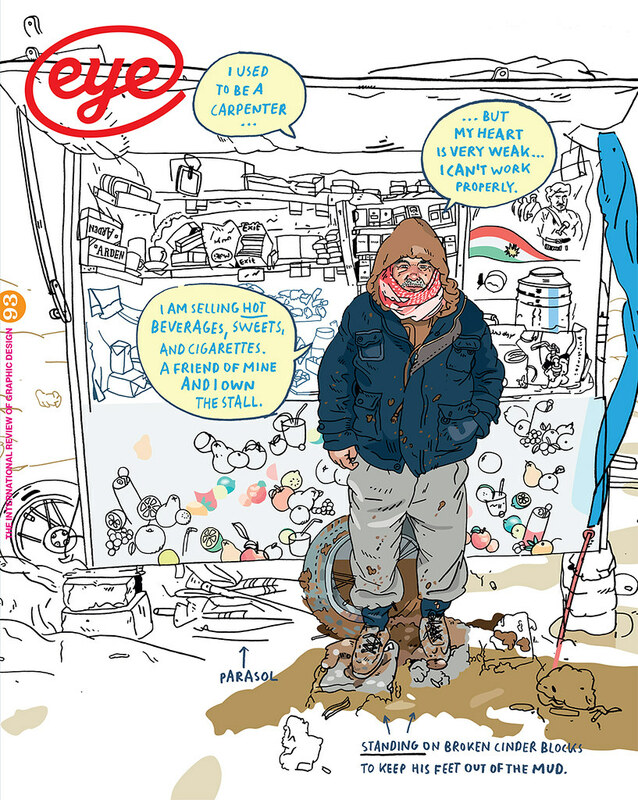 Top: Eye 93 cover with detail of Olivier Kugler’s portrait of Syrian refugee Muhamed, 2013. 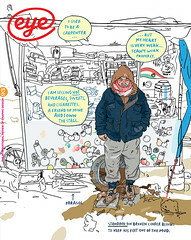 See ‘Olivier Kugler: bearing witness’.